You don’t like standardized tests. Parents across the nation have been protesting about them for years. We know schools use them to sort students and report achievement to the government. Aside from taking SO MUCH time from more creative pursuits in the classroom and stressing both teachers and students, what’s wrong with standardized tests? Standardized tests are an illusion. Administrators will tell you the tests are objective, meaning that all sorts of students have been subjected to the tests. The tests have been tested; these tests work. However, any test is only as good as the person or people who designed it. Many test builders aren’t the finest scholars in the field. They make mistakes, go by questionable assumptions, or may view the topics from a biased or over-simplified perspective. In other words, not all scholars would agree that the answers required by the test are the best possible. Standardized tests are written by and for people who think alike. On standardized tests, the writers get to decide what the questions mean and what the correct answers are. Anyone who interprets the questions or answers differently has to be wrong. The most bothersome reason why standardized tests are subjective (open to bias) is that someone or a committee of someones has to decide what a person needs to know. Does everyone need to know how to read? How to read poetry? How to read spreadsheets? How to read quadratic equations? How to read a star map or a blueprint or an x-ray? Where do we draw the lines? What do we do with students who are extraordinary in certain subjects and dreadful in others? Life is not simple. Consider the topic of climate change. It’s based on measurements, isn’t it? It’s based on history and science, isn’t it? Yet only a fool would pretend that everyone the world over sees the issues and the solutions as being the same. Who’s right? The fact is even the rules of English grammar are subjective. Who’s judging? A newspaper editor? An e-zine editor? Someone writing a text message? A doctoral dissertation committee? Grammar rules are different in different contexts. The conclusion is, then, that correctness lies in the eyes of the beholder. We guess what is usually correct and teach methods for reaching that answer, but every so often a student or bit of research comes along that forces us to see the information from an entirely different point of view. How can we know that some of the students who fail the test aren’t actually thinking on a more sophisticated level than the test designers? 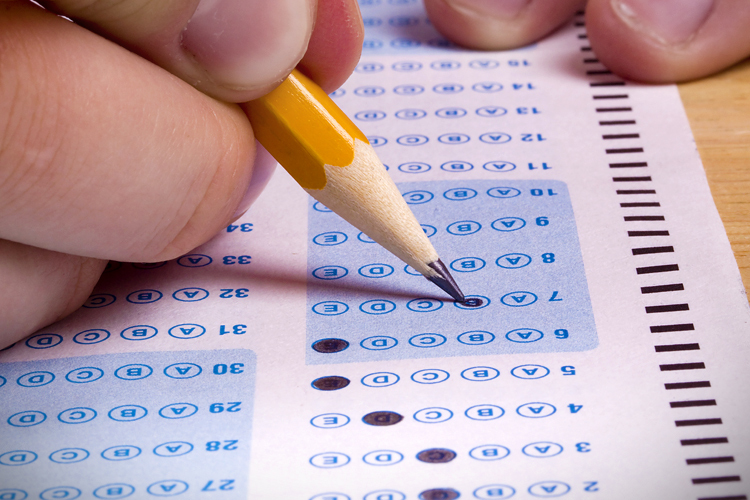 Why do we use standardized tests? Because they’re easy to give–in person or online. They’re easy to score. Scores are easy to report, translate into grades, and defend. A whole industry of test-designer-corporations makes enormous amounts of money grinding out new editions periodically. No thinking person can imagine that even the best tests are fair to all students, because they come from so many different backgrounds and have so many variations in the ways their brains work. We test for the average. The results discourage as often as they encourage. What they prove is debatable. Certain prestigious universities have stopped using college entrance exams to determine who will be accepted because they aren’t worth the cost. We use standardized tests when we don’t have a better method or don’t want to go to the trouble of using better methods that are available. To do better, we would have to prepare our instructors to assess individual students in a far more complicated world. We would have to devise more complex ways to determine whether what we teach as education is actually resulting in more satisfying lives for those taught. This entry was posted on June 14, 2014 by Personal Journeys with Gramma in Dear Gramma and tagged Correctness, Dear Gramma, featured, Grammar Rules, Objectivity, Outdated Methodology, Standardized Testing, Subjective, Test Designers, Test Writing, Test-taking Techniques, Testing Equating to Success, Testing is Illusion, Unrealistic.